WWE is saying it’ll be even more profitable than previously thought. In the company’s third quarter earnings report released today, it raised its adjusted OIBDA (a measurement of profit) projection for full year of 2017 from a record-setting $100 million to in the range of $108 million to $112 million. For the entire year of 2018, WWE predicts it will break the record again, bringing in “at least” $115 million. Most crucial to WWE’s business, the organization’s most valuable TV rights deals will expire in 2019. TV revenue is the company’s biggest revenue stream, accounting for about one-third of WWE’s money. WWE’s most valuable deal, with NBCUniversal (the parent of the USA Network) will end on September 30, 2019. WWE said it “expects to announce its plans for U.S. distribution between May-September 2018”. A U.K. deal (currently held by Sky) is expected to be announced by the end of 2018 and a new deal in India (currently held by TEN) by the first half of 2019. TV deals in the U.S., U.K. and India are believed to be WWE’s three most valuable TV partnerships. 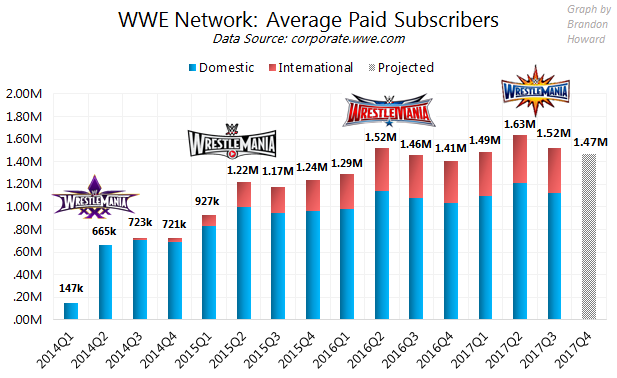 Subscribers for the WWE Network for Q3 were within range of the company’s earlier projections. The streaming service held an average of 1,522,000 paid subscribers from July 1 to September 30, slightly up from subs in Q3 2016 (1,458,000). Paid subscribers this quarter were within WWE’s projection of coming within 2% of 1,540,000. Q4 is projected to average within 2% of 1,470,000 paid subscribers. That would be down from Q3 but up slightly from Q4 2016’s number of 1,407,000. 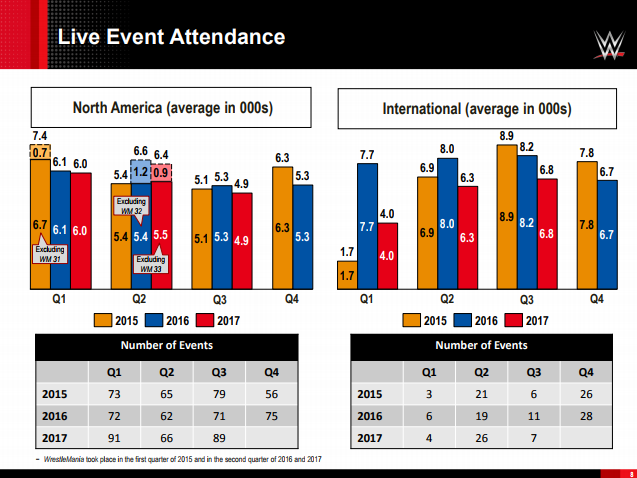 Amid pictures on social media from fans of scantily-attended arenas, WWE reported its lowest North American average attendance in recent memory, however Live Events business is bringing in more money due to more events and higher ticket prices. Attendance in the U.S. and Canada averaged 4,900, down from the same quarter in the previous two years. Despite that, revenue for Live Events was $32 million (up from $29 million in Q3 2016) and OIBDA was up to $7.2 million (up from $6.1 million in Q3 2016) as the brand split allows the company to run more events. 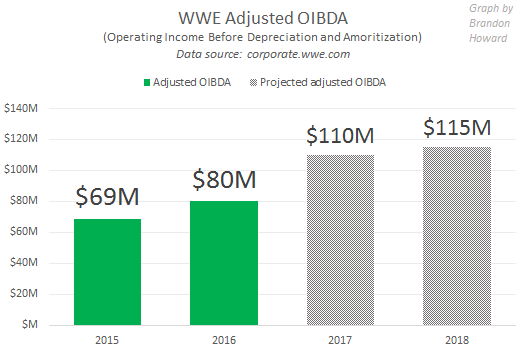 Money from NXT events is also included in revenue and OIBDA totals but not calculated into average attendance figures. Key Performance Indicators show TV ratings are only slightly down, an improvement from previous quarters as RAW’s ratings have been declining by upwards of 10% when compared the the same quarter in previous years. This quarter, both RAW and SmackDown were reported to have declined by 1%. That checks out with averages for viewership reported by Showbuzzdaily.com and TV ratings reported in the Wrestling Observer Newsletter. Now that the brand split is more than year old, this was the first quarter SmackDown had a brand-split quarter from the previous year to compare to. 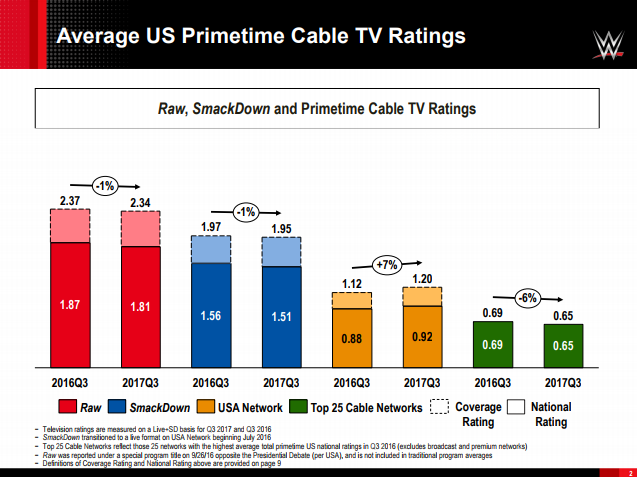 In previous quarters this year, SmackDown ratings were up versus that of the same quarter in previous years, just before the brand split. WWE noted Brexit has cost the company $3 million through the first nine months of the year, due to changes in the exchange rate on the British Pound. Follow Brandon on Twitter @BrandonThurston. Email him at [email protected]. He co-hosts Wrestlenomics Radio, a weekly podcast on wrestling business.